Just use an empty plastic bottle to easily separate eggs. Or buy a special separator. Save some of the hassle of peel ginger (and save the ginger) by using a spoon to peel the skin. Pit your cherries with this awesome gadget. This method will let you peel a whole head of garlic in just 20 seconds! Just use an intact egg shell to scoop those little broken bits out. Apple cider vinegar set up in a cup, like pictured, will become the fruit flies’ last home. It just shows you how to get rid of fruit flies easily and with simple natural home remedies. How awesome is this gadget? Keep your cheese from drying out with this ingenious kitchen gadget. 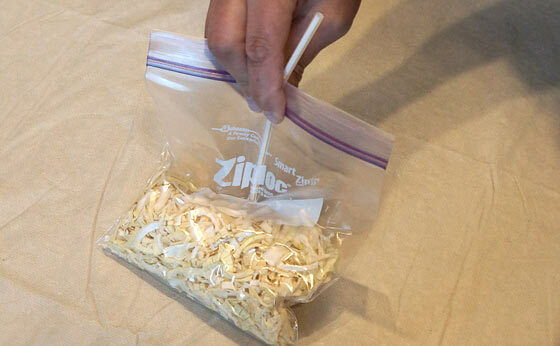 You can actually vacuum seal Ziploc bags just using a straw (and your own lungs of course). Don’t keep these items to yourself! Share this page!